The TOP SHELF KIDS CLUB celebrates Free Comic Book Day 2012! 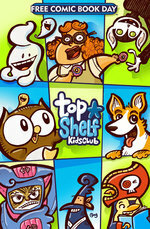 News | The TOP SHELF KIDS CLUB celebrates Free Comic Book Day 2012! 2011's not over yet, but we're already knee-deep in preparations for 2012 -- including one of our most fun projects of the year, the FREE all-ages comic book for Free Comic Book Day (May 5, 2012)! Check out this amazing cover by Pirate Penguin vs Ninja Chicken creator Ray Friesen! The interior will feature SIX new stories by the dream team of Top Shelf Kids Club authors: Owly by Andy Runton, Johnny Boo by James Kochalka, Korgi by Christian Slade, Okie Dokie Donuts by Chris Eliopoulos, Pirate Penguin vs Ninja Chicken by Ray Friesen, and Upside Down by Jess Smart Smiley. Wow, May 5th can't come soon enough! 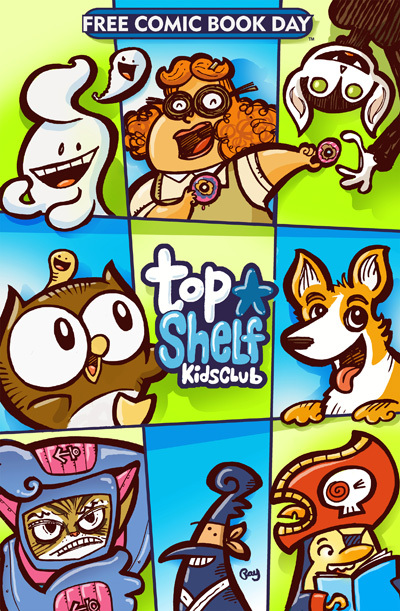 In the meantime, don't forget to check out the official Top Shelf Kids Club app for iPad, iPhone, and iPod Touch, where you can read the 2011 FCBD book and buy digital versions of all our great all-ages titles!